Mountaintop removal (MTR) mining involves the blasting off the tops of mountains to reach the coal seams below, with the millions of tons of former mountains pushed into stream valleys. MTR has buried nearly 2,000 miles of Appalachian streams, contaminated drinking water, impaired water quality for river recreation, increased water treatment costs for industry, displaced some communities, and increased susceptibility to flooding for others. An EPA environmental impact found that 724 miles (1,165 km) of Appalachian streams were buried by valley fills between 1985 to 2001, and that streams near valley fills from mountaintop removal contain high levels of minerals in the water and decreased aquatic biodiversity. The 2012 Environmental Science and Technology study "How Many Mountains Can We Mine? Assessing the Regional Degradation of Central Appalachian Rivers by Surface Coal Mining" concluded that decades of mountaintop-removal mining in Appalachia may have harmed aquatic life along more than 1,700 miles of streams in southern West Virginia. 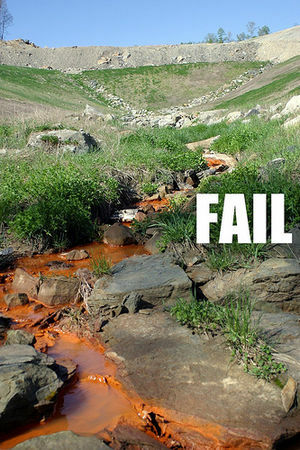 Mining companies have converted 5% of the region to mountaintop mines, and the resulting water pollution has caused so many sensitive species to vanish that 22% of streams may qualify as impaired under state criteria. Coal sludge also contains many heavy metals. Small amounts of heavy metals can be necessary for health, but too much may cause acute or chronic toxicity (poisoning). Many of the heavy metals released in the mining and burning of coal are environmentally and biologically toxic elements, such as lead, mercury, nickel, tin, cadmium, antimony, and arsenic, as well as radio isotopes of thorium and strontium. Burning coal produces airborne compounds, known as fly ash and bottom ash (collectively referred to as coal ash), which can contain large quantities of heavy metals that settle or wash out of the atmosphere into oceans, streams, and land. The amount of fly ash is going up: in 2006, coal plants in the United States produced almost 72 million tons, up 50 percent since 1993. The large quantities of toxic heavy metals in coal ash include lead, mercury, nickel, tin, cadmium, antimony, and arsenic, as well as radio isotopes of thorium and strontium. 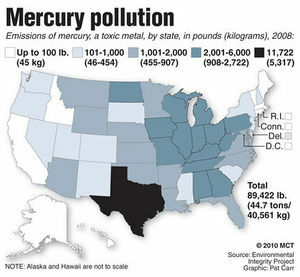 Emissions from coal-fired power plants are the largest source of mercury in the United States, accounting for about 41 percent (48 tons in 1999) of industrial releases. According to the Centers for Disease Control and Prevention, eight percent of American women of childbearing age had unsafe levels of mercury in their blood, putting approximately 322,000 newborns at risk of neurological deficits. Mercury exposure also can lead to increase cardiovascular risk in adults. When mercury is deposited on land or in water, microorganisms convert part of it to a highly toxic form called methylmercury. When fish and animals eat these microorganisms, the toxins accumulate and can interfere with reproduction, growth, and behavior, and can even cause death. Thermal pollution from coal plants is the degradation of water quality by power plants and industrial manufacturers - when water used as a coolant is returned to the natural environment at a higher temperature, the change in temperature impacts organisms by decreasing oxygen supply, and affecting ecosystem composition. Power plants can also potentially harm fish eggs, larvae, and other aquatic biota in their early stages, as they require particular combinations of fresh water flow and temperature, among other factors, all of which can be impacted by coal plant water usage. In June, 2010, Ohio environmental groups stated that the Bay Shore Plant along Maumee Bay is killing more fish than any other plant on the Great Lakes, costing Ohio $29.7 million annually. The Ohio Environmental Council, the Western Lake Erie Waterkeepers Association, Ohio Citizen Action and other groups are urging the Ohio EPA to make FirstEnergy, the owner of the plant, to install cooling towers at the plant -- which touches the Maumee River on one side and the Maumee Bay on the other -- in order to reduce the fish kills. Coal-fired power plants are the largest human-caused source of sulfur dioxide, a pollutant gas that contributes to the production of acid rain and causes significant health problems. Coal naturally contains sulfur, and when coal is burned, the sulfur combines with oxygen to form sulfur oxides. Acid rain is rain saturated with chemicals like sulfur dioxide and nitrogen oxide, which causes acidification of lakes and streams. Prior to falling to the earth, sulfur dioxide and nitrogen oxide gases and their particulate matter derivatives—sulfates and nitrates—contribute to visibility degradation and harm public health. The use of bagpipes and scrubbers to trap pollutants and toxins from power plant emissions like sulphur creates coal waste that can leach into groundwater and waterways, contaminating drinking water supplies. Many of the heavy metals released in the mining and burning of coal are environmentally and biologically toxic elements, stored in federally unregulated coal waste sites. Sulfur dioxide scrubbers also create coal waste. The flue-gas desulfurization (FGD) process creates a wet solid residue containing calcium sulfite (CaSO3) and calcium sulfate (CaSO4). Often dry material such as fly ash is added to stabilize the sludge for transport and landfill storage. Coal combustion waste is the nation's second largest waste stream after municipal solid waste. A power plant that operates for 40 years will leave behind 9.6 million tons of toxic waste. According to a New York Times analysis of EPA data, power plants are the nation’s biggest producer of toxic waste, surpassing industries like plastic, paint manufacturing, and chemical plants. It is disposed of in landfills or "surface impoundments," which are lined with compacted clay soil, a plastic sheet, or both. As rain filters through the toxic ash pits year after year, the toxic metals are leached out into the local environment. As of June 2010, no federal regulations specifically govern the disposal of power plant discharges into waterways or landfills. Some regulators have used the Clean Water Act to try and limit pollution, but the law does not mandate limits on many dangerous chemicals in power plant waste, like arsenic and lead. State officials sometimes place no limits on water discharges of arsenic, aluminum, boron, chromium, manganese, nickel or other chemicals that have been linked to health risks. According to a New York Times analysis of EPA records, 21 power plants in 10 states have dumped arsenic into rivers or other waters at concentrations as much as 18 times the federal drinking water standard. Only one in 43 U.S. power plants must limit how much barium is dumped into nearby waterways, despite being commonly found in power plant waste and scrubber wastewater and linked to heart problems and disease. EPA records indicate power plant landfills and other disposal practices have polluted groundwater in more than a dozen states, while a 2007 EPA report suggested that people living near some power plant landfills faced a cancer risk 2,000 times higher than federal health standards. Power plants have often violated the Clean Water Act without paying fines or facing other penalties: ninety percent of 313 coal-fired power plants that violated the law since 2004 were not fined or otherwise sanctioned by federal or state regulators. And fines are often modest: Hatfield’s Ferry has violated the Clean Water Act 33 times since 2006, but has paid less than $26,000, even as the plant’s parent company earned $1.1 billion. According to the New York Times, after five states — including New York and New Jersey — sued Allegheny Energy to install scrubbers at one of its coal plants, the company began dumping tens of thousands of gallons of wastewater containing chemicals from the scrubbing process into the Monongahela River. The River provides drinking water to 350,000 people and flows into Pittsburgh. nearly half of the coal plants surveyed (187) are operating with an expired Clean Water Act permit, most five or more years ago. ↑ Emily S. Bernhardt, Brian D. Lutz, Ryan S. King, John P. Fay, Catherine E. Carter, Ashley M. Helton, David Campagna, and John Amos, "How Many Mountains Can We Mine? Assessing the Regional Degradation of Central Appalachian Rivers by Surface Coal Mining," Environmental Science and Technology, July 12, 2012. ↑ 5.0 5.1 5.2 5.3 "Green Coal?," Rachel's Environment & Health News, November 6, 2008. ↑ [http://www.portclintonnewsherald.com/article/20100603/NEWS01/6030305"> Kristina Smith Horn, Port Clinton News Herald, June 3, 2010. America's Top 10 Most Polluted Waterways, Mother Jones, April 2, 2012. This page was last edited on 31 March 2015, at 20:03.